Here’s a quick quiz for you. What’s the best-selling sedan in the states? Easy, the Toyota Camry. What car takes the number two spot? The Accord? Hyundai Sonata? Ford fusion? All wrong, it’s the Nissan Altima. The number two Nissan Altima seems to get overlooked when discussing midsize sedans, I’ll admit it often slip from mind. Then I drive one and instantly realize why it deserves its spot on the list. The fifth-generation 2013 Nissan Altima received a major makeover and it’s even better than its predecessors. What’s new for 2013? The Altima received a re-skinned and stouter body that managed to shed 80 pounds and most importantly features a continuously variable transmission (CVT) that offers better fuel economy and acceleration. New convenience features include a hands-free text messaging assistant and a lane departure warning and rear moving object detection system – none of which can be found elsewhere in the segment. The interior has also been completely redesigned, easily putting it on par with the Maxima. Features are great, but how’s the 2013 Altima drive? Fantastically. I was initially worried that the CVT in the 2013 Nissan Altima 3.5 SV would take the bite out of the historically athletic sedans acceleration. I was wrong. Zero to 60 mph happens in a brief 6 seconds, making it the quickest car in the segment despite having a CVT while its competition relies on 6, 7 or even 8 speed transmissions. Continue with the fun and the Altima will pass the quarter-mile mark in 14.3 seconds at 99.8 mph. Pretty damn quick for a midsize sedan. Interestingly, the 2013 Altima received no additional power. The same 3.5-liter V6 remained unchanged from 2012 – still good for 270 horsepower and 258 ft.lb. of torque. So why is the Altima quicker? For one it shed some weight, the car is about 60 pounds lighter then it was in 2012. The car is also much more aerodynamic, Nissan says the drag coefficient was reduced by 5 percent. Neither of those account for the drastic change in quickness though. Most of the credit goes to the best CVT I’ve ever driven. Having read my previous reviews it wouldn’t be a stretch to say I’ve been tough on CVT’s. Nissan, however, has done something magical in the Altima. They built a CVT that actually works. Punch the accelerator and the CVT responds instantaneously with 6,800 rpm revs delivering plenty of fun. The CVT doesn’t struggle to find a place to sit or rubber band continuously, it’s smooth, quiet and responsive. The CVT not only allows the Altima to get going quicker it also allows the car to get better gas mileage. 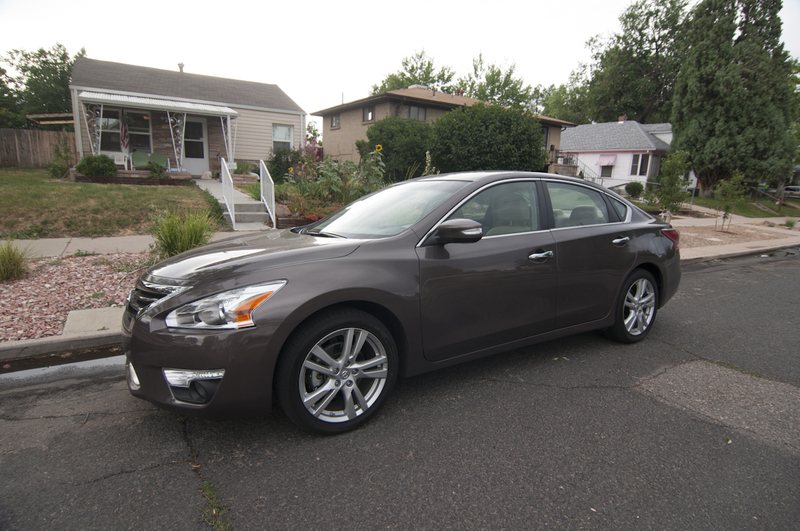 Compared to the 2012 Altima, the gas mileage is up by 2 mpg in the city and 4 mpg on the highway – 22 city & 31 highway. If you choose to go the 2.5 liter four-cylinder route you’ll be able to get 27 city/ 38 highway. Impressive numbers for a midsize sedan. The new Altima doesn’t just go fast in a straight line, it handles like a dream too. The Altima’s responsive steering and predictable chassis made attacking my favorite mountain roads a dream. There’s still some torque steer, but it’s more than manageable. You don’t buy a midsize sedan to go fast, you buy one to get you places. A large part of the reason the 2013 Nissan Altima is such a pleasant car to get places in is due to its seats and NASA. Yes, NASA. The seats were inspired by NASA and their research on seating and posture. Nissan says the seats reduce spinal loads and improve blood flow. Whether or not that’s all true, they really are some of the most comfortable and well balanced seats I’ve had the opportunity to sit on. The fabric adorning said seats is also some of the best I’ve seen. Thick, soft and clearly ready for the long haul, unlike the thin, plastic wrap like stuff found in much of the segment, the fabric reminded me of the fabric in my ’95 Camry – and it still looks new after 17 years and 175,000 miles so it’s certainly a compliment. Major controls are easy to find and simple to use and everything looks and feels high quality. Even in fabric the interior was classy-looking without being over the top or looking like it was trying too hard. A best in class interior with great handling and sporty acceleration make for a truly enjoyable driving experience. The 2013 Nissan Altima 3.5 starts at $26,140. The 2013 Nissan Altima not only deserves to be on your midsize sedan consideration list, it probably deserves the top spot. The Altima’s high quality interior and more dynamic driving experience make it a better car then the Camry, especially if you have a penchant to go fast. Even if you don’t want to go fast the 2013 Nissan Altima still delivers impressive fuel economy, great seats and a comfortable ride. If Nissan would just poach Kia’s exterior design crew to pretty up the Altima’s exterior they would easily secure the #1 midsize sedan spot.